Since the auxiliares de conversación program only lets English-speakers like me stay in Spain between October and May, I have inevitably come back home to Texas in the summers to work and save money and to spend time with my family. But to hold me over from my last menú del día meal in Madrid and to satisfy my love of Spanish painters, Dallas thankfully has a lot of Spanish-themed offerings, all within the same general area. 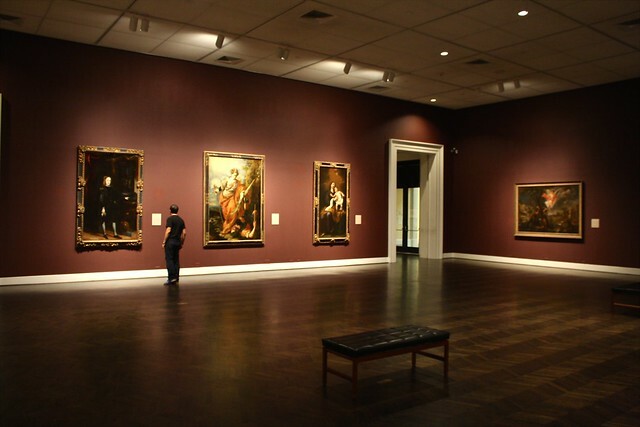 On the campus of Southern Methodist University in Dallas’ elite Park Cities enclaves, the Meadows Museum is probably the premier collection of Spanish art outside of Spain. It opened in 1965 as a result of countless donations from the private collection of oilman Algur H. Meadows. As head of the Dallas-based General American Oil Company, he frequented the Spanish capital of Madrid in the 1950s since his company was searching for oil reserves there at the time. While in Madrid, Meadows got to spend hours browsing the world-class Prado Museum and gained a lifelong appreciation for Spanish art. 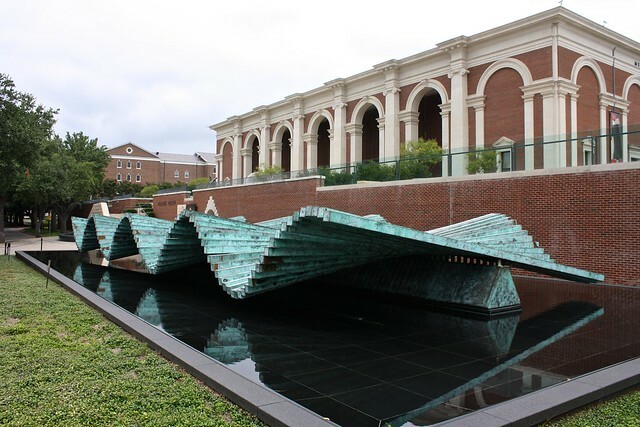 The museum moved into its current location in 2001, a building that blends in with the neoclassical brick-and-stone structures on SMU’s campus but also recalls the stateliness of the Villanueva Building that houses the Prado itself. To commemorate the grand opening of the new building, Spanish avant-garde architect Santiago Calatrava designed a sculpture that you can see along Bishop Boulevard: a series of 129 bronze beams go up and down, staggered one after the other to create a “wave” effect. Calatrava also designed the Margaret Hunt Hill Bridge spanning the Trinity River just outside of downtown Dallas. 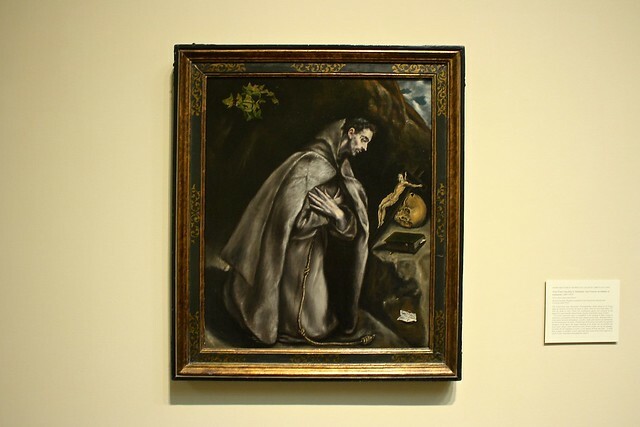 The collection itself is truly impressive, and encompasses artifacts from medieval times like frescoes and medieval altarpieces to all the Golden Age masters like El Greco, Velázquez, Ribera, and Murillo. You can also find works by such famous Spanish artists as Goya, Sorolla, Miró, and Picasso—of course the museum has a Picasso! Strolling through the museum’s halls takes around an hour, so it’s not an exhausting undertaking like visiting Spain’s Prado is. Coincidentally enough, though, the Spanish word prado means “meadow,” which just so happened to be the last name of the museum’s generous benefactor. How to get there: The Meadows Museum is on the campus of SMU in University Park, a tiny enclave of Dallas proper at the intersection of US-75 (Central Expressway) and Mockingbird Lane. It’s easy to get to via the Red, Orange, and Blue light rail DART lines, and Mockingbird Station has a shuttle (#743) that connects the train station, the museum, and the George W. Bush Presidential Library. 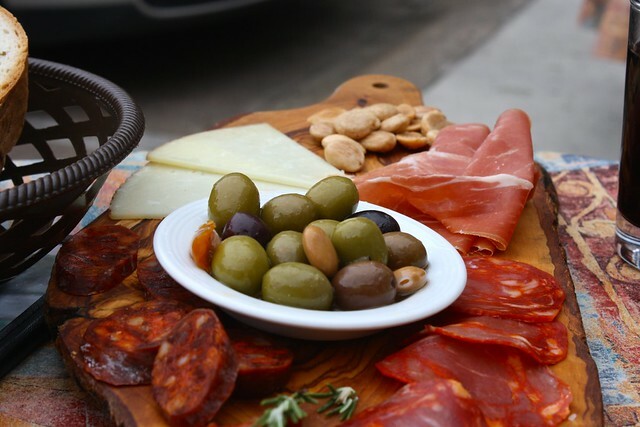 Barely five minutes’ drive south of the Meadows Museum there’s an authentic Spanish-cuisine restaurant called Café Madrid in the lively Knox-Henderson neighborhood. I’ve been going here for a couple years now as it’s one of the few places to eat Spanish food in the DFW area, and I didn’t pass up an opportunity to stop by here this summer. After checking out the exhibits in the Meadows Museum with a friend from college, we took a seat on a patio table at a very Spanish time for lunch, 2pm. 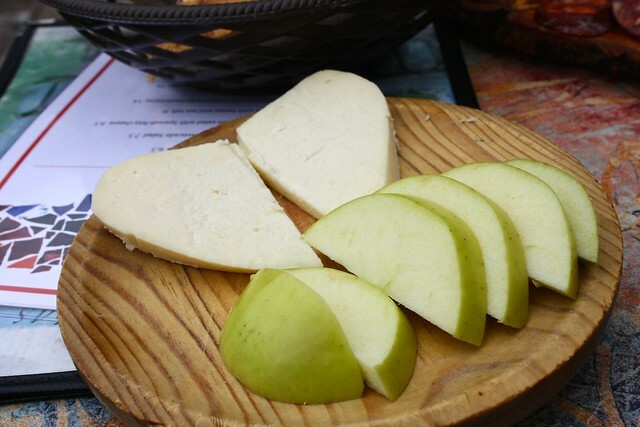 We ordered a plato ibérico of some sausages, cured ham, cheese, almonds, and olives, as well as four croquetas (fried nuggets) and a plate of Galician cheese and apples—and I have to say that everything tasted as it should have. But I think the problem with most “Spanish” or “tapas” style restaurants in the U.S. is that they don’t accurately recreate the experience of dining in Spain—mainly because they’re so outrageously expensive! 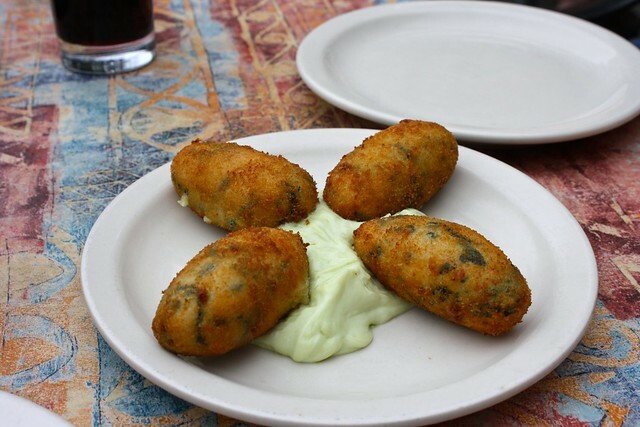 As Kaley of Y Mucho Más explains on her blog post, restaurants serve tapas (small plates) for the price of Spain-sized raciones (or appetizer platters). 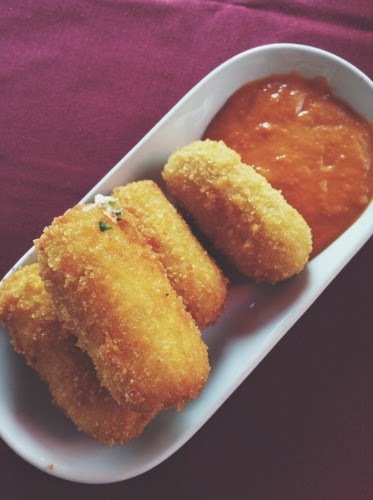 Like, those four vegetarian croquetas in the picture above? EIGHT dollars. They would have cost three, maybe four euros in Spain—or they would have been free with a drink. And I understand that the meat-heavy plato ibérico might be a little pricey due to import costs, but charging $5 for a piece-of-pie-sized slice of Spanish tortilla? I could buy a 10-lb. bag of potatoes, a 2 1/2 dozen eggs, and several onions at Walmart and make six whole tortillas for $10. Anyways, the priciness aside, Café Madrid does make legit Spanish food—just be aware that this is a $$ restaurant. How to get there: Café Madrid is located at 4501 Travis Street, Dallas, TX 75205, a few blocks west of US-75 and a short drive south from SMU. The 521 bus passes through this neighborhood on its way between the Mockingbird and City Place/Uptown DART light rail stations. Oddly enough, another of Dallas’ handful of Spanish restaurants is in the exact same neighborhood as Café Madrid just a few blocks away! I came back to the Uptown Dallas area a few weeks ago to meet up with a friend I met in Galicia (we were both from Dallas? whoa!) and we ordered some fried calamari (calamares fritos), croquetas, and a small Spanish tortilla (but it was the entire omelet, not just a slice). The food was of decent quality, and while the croquetas were delicious as they should be, the breading was a little too coarse and thick. 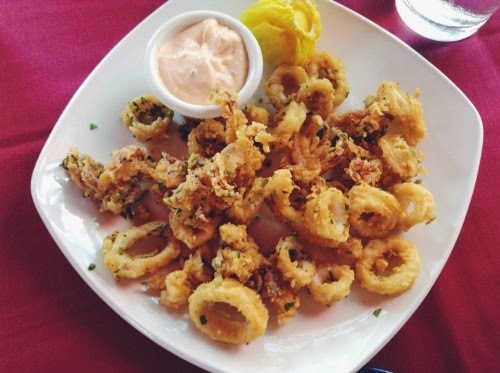 The fried calamari was a lovely reminder of one of Spain’s typical but little-talked-about dishes, and the ali-oli sauce was so very savory. My friend and I weren’t to keen on the tortilla, though; it had all the right ingredients—eggs, potatoes, onions—but something about it was off, as if they poured beaten eggs into the frying pan and then sprinkled the veggies on instead of mixing it all up in a bowl first. How to get there: Sangría Tapas and Bar is located at 4524 Cole Avenue, Dallas, TX 75205, just around the corner from Café Madrid. The 521 bus stops a few yards away from the restaurant, so you’re good to go! Have you ever tried Spanish food in America? Was it terrific or terrible? Tell me how you fared in the discussion below!